The external fuel tank for the space shuttle's last scheduled mission was carried from the Pegasus barge into the Vehicle Assembly Building at NASA's Kennedy Space Center in Florida Tuesday, Sept. 28, 2010. 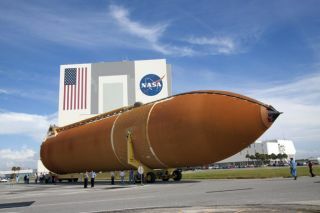 The external fuel tank for what couldbe the last mission ofNASA's space shuttle program rolled into an assembly building at theKennedySpace Center in Florida yesterday (Sept. 28). Technicians at Kennedy will nowprocess and stack the tankin preparation for the launch of the shuttle Endeavour to the InternationalSpace Station on Feb. 26, 2011, NASA officials said. The tank is about 154 feet (47meters) long and 28 feet (8.5meters) wide and weighs nearly 60,000 pounds (27,273kilograms) when empty. Itarrived in Florida Monday from a NASA facility in New Orleans. When full, the tank will containliquid hydrogen and liquidoxygen, which will power Endeavour's engines during liftoff and ascent.Thetank will be flanked by twin solid rocket boosters strapped to theorbiter'ssides, which will also help carry the shuttle aloft. The tank and boosters will bejettisoned and fall back toEarth after Endeavour's initial push to the sky. Unlike the boosters,however,the external tank will not be collected and reused. Endeavour is slated to deliver anearly $2 billion astrophysicsexperiment designed to study cosmic rays from the space station. TheSTS-134mission will also deposit some spare parts for the outpost. Endeavour's flight is the lastscheduled shuttle mission andone of onlytwo remaining on the docket. Congress, however, is discussing thepossibility of an extramission, to be flown by the shuttle Atlantis sometime next year. TheSenate hasapproved the additional flight, but the measure has yet to make itthrough theHouse. The shuttle Discovery is scheduled tolift off Nov. 1 on an11-day mission to the space station. Discovery is expected to deliver astorage room to the spacestation, along with a humanoid robot assistant for the outpost'sastronautcrew.